The German Werkbund was an association of artists, designers, and architects that prefigured the Bauhaus. 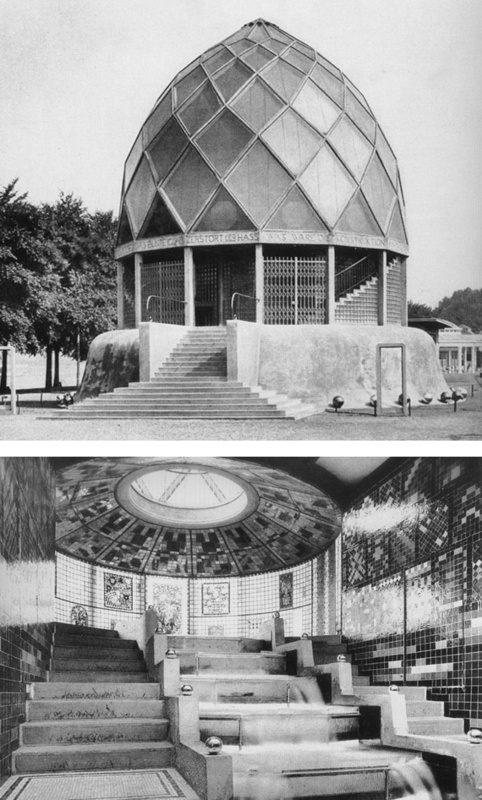 Unveiled at the Werkbund's 1914 exhibition in Cologne, Bruno Taut’s (1880-1938) Glass House was a successful amalgamation of aesthetic, technical, and commercial elements. The building was conceived by Taut and the poet Paul Scheerbart (1863-1915), whose verses adorned the exterior base of the dome. The house was an explosion of color. The interior was constructed of glass floors and walls and mosaic windows. It also included an exhibition of information on the project's glass-industry sponsors. Source: Frederic J. Schwarz, The Werkbund: Design Theory and Mass Culture before the First World War. New Haven and London, 1996, pp. 184-85.